John Shepard is a craftsman who has loved wood working since he was a small child. His loved has turned into a passion, and Shepard has created something of his own version of Santa’s Workshop. He doesn’t have any elves or any workers, he simply works by himself to create simplistic, everlasting toys for children during the holiday season. Shepard uses only wood to construct his toys, specifically pine wood. He carves rocking horses, giraffes, bears and much more! His goal is to reach the children in a ways that seem to have been lost with modernity. Children these days are obsessed and somewhat forced to like plastic toys with buttons, lights, and bells and whistles. These toys not only break often because of their cheap manufacturing, but also stifle a child’s imagination. The plastic modern toys do all of the imagining for the child, leaving no room for the child to be creative. 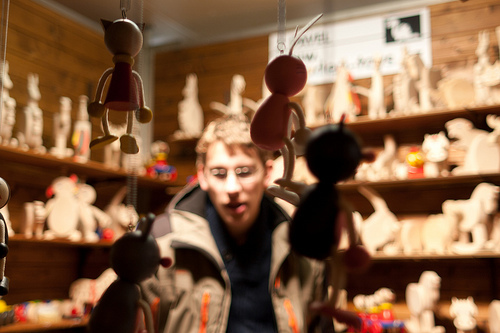 He has realized, over the many years of carving these toys, that children really do appreciate the simplicity of traditional toys because of the simple fact that it gives them the mental stimulation of creative thought. These traditional wooden toys give a child a sense of comfort and stability, seeing as these toys will last a lifetime and leave lasting memories on a child.